Caylee/Casey Anthony Case: Will Judge Rulings Today Be Defense Doomsday? Chief Judge Belvin Perry promised to rule on 2 outstanding motions by her defense team today. Rulings on Critical Motions regarding a hair with a "deathband" that could only belong to a deceased individual and either Casey or Caylee Anthony, and the air samples tested by Dr. Arpad Vass and found to contain chloroform levels he has never seen, in his 22 year career. The air samples themselves are not in contention as the "hardware" and methodology in their extraction are used widely in the scientific community, and the defense team, through a stipulation agreement to withdraw contempt proceedings against him, could not argue about anything else. The defense argument was largely about the interpretation of the data that was yielded from the samples as they relate to a decompositional event in the trunk of Casey's car. Both motions were a combination of a Frye/exclusion attempt by the defense that took several days in court to conclude, in which many observers felt were disorganized and poorly argued in contrast to the deft responses by the prosecution. Yesterday, for the second time, Jose Baez on behalf of Casey Anthony filed a response to the State's motion to let his already withdrawn "experts" Dr. Danzinger and Dr. Weis be permitted to testify as to what Casey told them during their interviews with her. You may recall, during the State's deposition attempt of Dr. Danzinger, Judge Perry put the kibosh to it after receiving a call from Jose Baez, and both depositions have since been sealed. Judge Perry referenced testimony about Post Traumatic Stress Disorder, or PTSD, but legal experts agree that in itself would not be grounds for suspending a deposition and immediately sealing it. It is this editors opinion that during the deposition, Dr. Danzinger recounted parts of his interview with Casey Anthony that may have been incriminating to her. 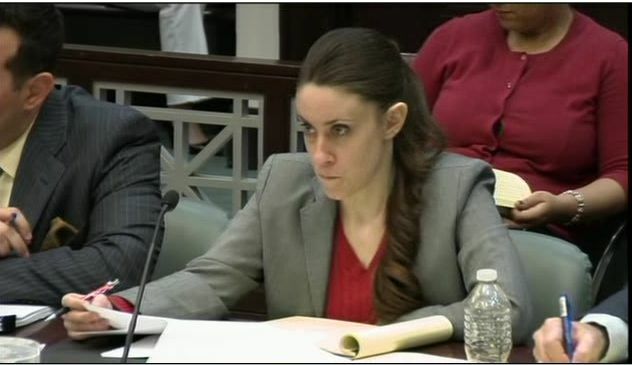 It was abundantly clear that the defense strategy is/was to attempt to have these witnesses speak about parts of their interviews with Casey Anthony as a way to repeat her "defense" without ever taking the stand, subjecting her to cross-examination by the state. It is also abundantly clear that Jose Baez et al did not understand the Judge's comments about these depositions the first time around. The only way these "Docs" will be permitted to testify to anything Casey Anthony told them, is if Jose Baez presents an exception argument to the hearsay rule, and since the "declarant" or Casey Anthony, will never take the stand, 'not gonna happen. Yesterday afternoon, the defense depositions of Tony Lazzarro and Amy Huizenga were filed with the court. While there was largely previously known information contained in both depositions, there was one noteworthy tidbit in Ms. Huizenga's which the defense glossed over in a hurry. Reported exclusively by www.blinkoncrime.com, the Anthony's withheld a major plumbing emergency at their home that sent someone from Hopespring Drive in a panic to locate Caylee. This article will be updated when Judge Perry rules this afternoon. Check back to www.blinkoncrime.com for continued breaking news in the case against Casey Anthony.